Who knew that as an adult I would still be obsessed with goldfish and even utilize this snack in my profession. 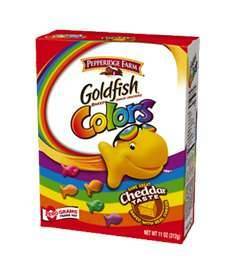 The Goldfish Colors are an awesome resource for gathering information and for exploring feelings. Both the Get to Know You Goldfish Activity and the Colorful Feeling Goldfish Activity are perfect to use in a small group or during an individual session. If you are working with a new student or starting a new group, I recommend using the Get to Know You Goldfish Activity as an icebreaker. Make sure to include at least one goldfish of each color when preparing the Ziploc bags. Each group member will receive their own bag of fish. Instruct each student to pull out one goldfish. If the student picks a yellow fish then he or she will share something about their family. If the student picks a red fish then he or she will share something about school. If the student picks a green fish then he or she will share something about their friends. 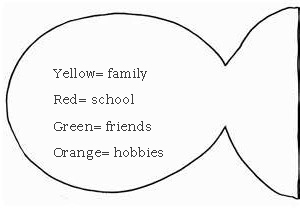 If the student picks an orange fish then he or she will share something about their hobbies. You may continue this process until all of the fish are eaten. The Colorful Feeling Goldfish Activity is a delicious way to explore feelings. Just like the other activity each student receives a bag of fish. If the student picks a yellow fish then he or she will share something that makes him or her feel happy. 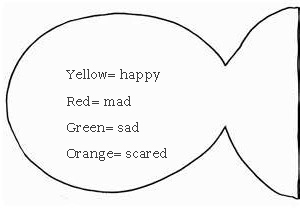 If the student picks a red fish then he or she will share something that makes him or her feel mad. If the student picks a green fish then he or she will share something that makes him or her feel sad. 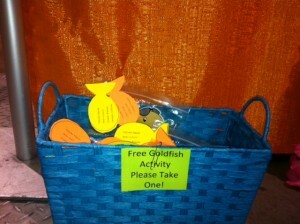 If the student picks an orange fish then he or she will share something that makes him or her feel scared. If you are working with a student who is constantly angry then it would be a great idea to add more yellow fish to his or her bag. This will help the student focus on happy things.